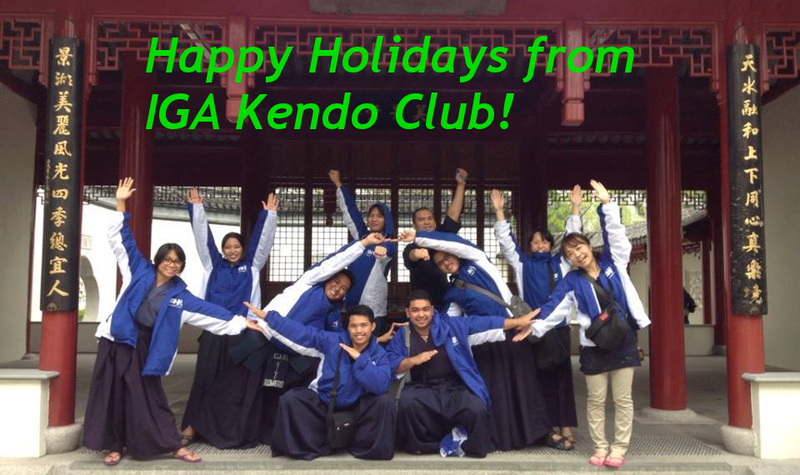 Happy Holidays from IGA Kendo Club! The following are the IGA Kendo Club Dojo schedules for the month of December. Dec 20, Saturday, 2pm to 6pm - Last Official Practice of the year. Dec 20, Saturday, 10am to 12nn - Last Official Practice of the year. Dec 21, Sunday, 4pm to 6pm - Last Official Practice of the year. Regular practice will resume starting January 3, 2015. Have a happy and meaningful holiday season everyone! This entry was posted in IGA-Ken News, Training Schedule and tagged Arena Fitness Dojo, City Club Dojo, Dasma Dojo, Iga ken, Iga Kendo, IGA Kendo Club, kendo, Philippine Kendo, training schedule. Bookmark the permalink. ← Offering New Classes in Alphaland City Club! Thank you very much!!!! 2014 all schedule of IGA剣. KOJI.